World premiere: Feig Electronic launches a wearable on the market that minimizes time losses in production and logistics, increases productivity and creates consistent transparency. RFID & Wieless IoT Global spoke exclusively with Markus Desch, Head of Business Division, Identification & Payment, and Andreas Binder, Head of Product Line Panmobil, Feig Electronic, about what lies behind the development, which features the wearable includes, and which potentials can be leveraged in which processes with this device. Wearables are experiencing increasing demand in markets worldwide. Order picking, assembly, sorting - these are processes in logistics and production that often cannot be automated, and companies are desperately looking for solutions. Mobile devices that can be worn directly on the body and for which no additional handing is required open the door to solving numerous challenges. The contribution of human labour not only becomes more efficient through the use of wearables, but also increases the value of the human contribution in highly automated production and logistics systems. Wearables can thus pave the way for the future position of people in the value chain. Wearables are not intended to replace established solutions 1:1 and thus push them out of their applications. Rather, they create benefits in the peripheral areas of automation wherever automated identification reaches its limits. After more than a year of intensive development work, Feig Electronic has now incorporated these requirements and potentials into a completely new solution: the HyWEAR compact. With this first device in a product family that will continue to develop in the coming years, Feig Electronic is opening a completely new chapter after almost 30 years in the field of RFID hardware development. "There is a great demand for wearable devices in the market," says Markus Desch. He explains: "The tendency of numerous international companies to use wearable devices in specific processes is not new. On the other hand, the range of well thought-out, mature devices that are also available in large quantities is mediocre." This fact, as well as the results of numerous conversations with customers worldwide, has prompted the development team at Feig Electronic to develop a device that fully meets the requirements of the various applications. At the same time, the HyWEAR compact is not a proverbial 'leap into cold water' for Feig Electronic. About two years ago, the developers of Panmobil, a company that has been part of Feig Electronic for about a year, presented the first Auto-ID-capable glove. "The HyWEAR compact is a completely independent new development. Nevertheless, the Panmobil glove from 2017 influenced the concept in a significant way, because the feedback from customers at that time and from the past two years had a considerable effect on the design of the HyWEAR compact," explains Andreas Binder. ... But Why do Companies Need Wearables? Markus Desch and Andreas Binder emphasise that bringing a wearable onto the market is not intended to replace established handheld solutions. Rather, wearables are to become a solution for areas and specific processes in production and logistics for which there has been no technological support until now. "We at Feig Electronic see the use of wearables as useful in optimising whatever processes cannot be automated. For example, all objects which are not recorded by an automated solution due to their size, their design, or the material used must be recorded manually. And this is exactly where the HyWEAR compact comes into play," Markus Desch explains the objective of the development work. Andreas Binder adds: "A wearable can and should never be a 100 percent replacement for a handheld. Rather, it is necessary to take a close look at the applications in which a wearable offers added value over a handheld. However, this will not be the largest market share. Rather, wearables open up the possibility of implementing solutions in applications in which no other devices can be used." The first wearable with RFID and barcode functionality was presented at the Logimat 2017 trade fair – then still called Panmobil. "This was an important first attempt to present a wearable and to receive feedback from the market. Based on the feedback from companies on this wearable glove, it quickly became clear that this was not the best possible design for the processes of the interested companies," says Andreas Binder, looking back and explaining: "The fact that this glove could not establish itself on the market was not a problem. Rather, this first experience with the subject of wearables gave us the decisive edge in the development of the HyWEAR compact," he says. The clearest difference between the Panmobil and the HyWEAR compact can be seen at first glance. The HyWEAR compact is worn like a fingerless glove on the back of the hand and can be worn over any kind of glove. "Using the fingerless glove as the basic form was a direct result of feedback from the market. Firstly, a wearable that does not cover the fingers or wrists is more comfortable to wear. The full freedom of movement of the hand is also retained. Secondly, in the design of the HyWEAR compact we deliberately deviated as far as possible from the idea of the glove, because gloves are in part a strictly regulated topic in industry. There are prescribed glove types and materials that have to be used in certain work processes. And since Feig Electronic's focus is not on the development of gloves, but on identification technology, we have been able to identify the back of the fingerless glove as the most suitable design. This design chosen during development allows problemfree use together with a prescribed glove, for example in automobile production, when employees have to grip and identify painted or leather-covered parts," says Andreas Binder. The main challenge in the development of a wearable intended for worldwide use in sometimes large quantities was the combination of different identification technologies with communication interfaces such as WiFi or Bluetooth, which according to Andreas Binder are a must-have today. "On the one hand, all components in the HyWEAR compact are selected and assembled in such a way that optimum utilisation of the available energy is guaranteed in every situation. On the other hand, a wearable also requires significantly less energy in the acquisition process because the scan is carried out at a very short distance so the transmission power for RFID acquisition can be reduced compared to a handheld. 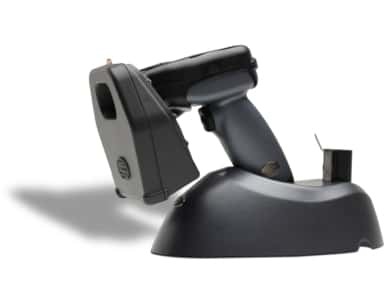 Nevertheless, an RFID reading process requires significantly more energy than a barcode scan. 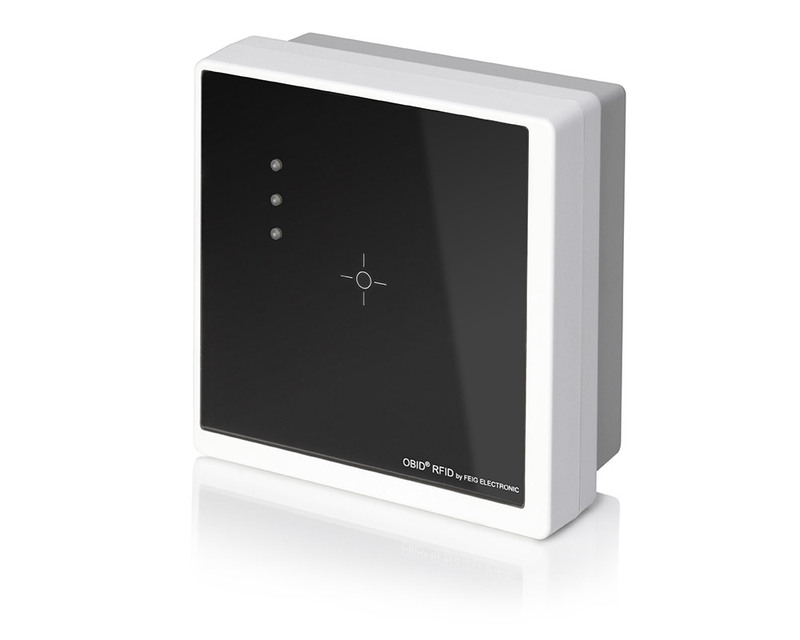 If, for example, a permanent WiFi connection is required in parallel with RFID scans, energy consumption also increases. In order to still be able to work a complete shift, the HyWEAR compact is designed in such a way that the battery can be changed in a matter of seconds - with just a few hand movements, single-handedly and without having to take the device off." As an option, a multiple-slot charging tray can be provided at each workstation, in which replacement batteries can be charged or kept fully charged in parallel. This ensures an almost uninterrupted working process. From Markus Desch's point of view, a wearable such as the HyWEAR compact is an ideal tool for digitally supporting processes on the edge of automation possibilities and thus creating transparency in the sense of Industry 4.0. Even if digital transformation in more and more production and logistics areas makes human intervention unnecessary, there are processes in which automation is not easily possible or reaches certain limits. "We consider the HyWEAR compact to be ideally suited for error control and troubleshooting, for example. Firstly, the faulty part can be clearly identified using identification technology. Secondly, the operating employee always has both hands free to intervene immediately." Although a wearable can be a real problem solver in the scenario described by Markus Desch, the HyWEAR compact's areas of application are much broader. "We offer an SDK for the device. This enables system houses and integrators to integrate the HyWEAR compact into existing systems and software environments relatively easily and thus time-efficiently." Light or Stable? No Compromises! "When developing the HyWEAR compact, special attention was paid to low weight and high stability. Even though the wearable is securely attached to the fingerless glove and therefore will fall considerably less frequently than traditional handhelds, the HyWEAR compact is made of impact-resistant yet lightweight materials so that the weight savings do not affect the robustness of the device. The HyWEAR compact can withstand contact with shelves, boxes, or other objects which the user grabs," reports Andreas Binder. "Feig Electronic has many years of experience in the development of UHF RFID components and can therefore draw on a wealth of experience, tools, and methods in the development of new devices. In this way, they can be adapted to the respective application, for example to avoid scattering," explains Markus Desch. "With the HyWEAR compact, we are launching a new product onto the market that opens up new possibilities for digitising processes that were previously not digitisable, but above all is for optimising existing processes. 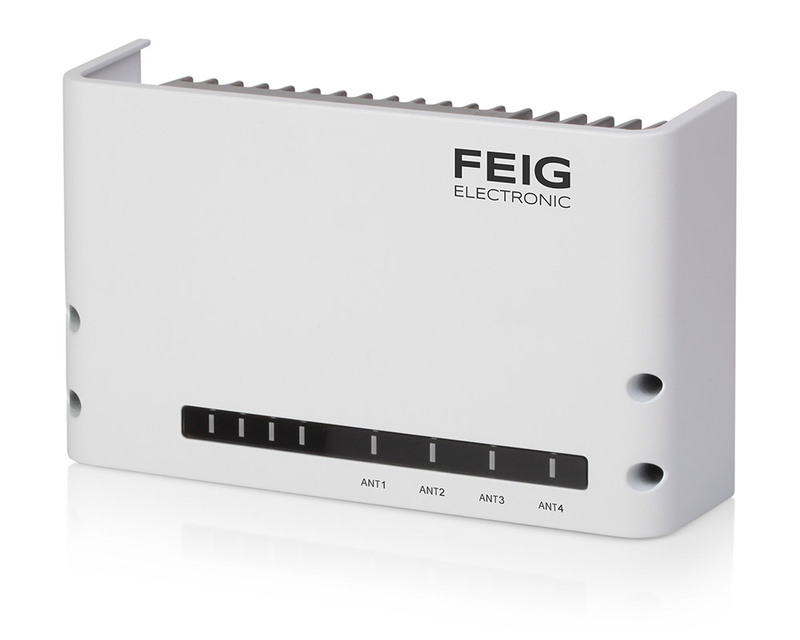 The know-how and competence of the Feig Electronic Solution Partners and system integrators, who integrate the product into the diverse applications of our end customers, is of great benefit here. In terms of software technology, the wearable can always be adapted to customer-specific requirements via the SDK. A certain modularity in the functions, as seen in the Panmobil handhelds already established on the market, is guaranteed by different variants. With the HyWEAR compact, WiFi and Bluetooth will always be on board. In addition, there will be a pure barcode device, a pure UHF RFID device, and a hybrid combination device with both identification technologies. Individualisation in terms of the housing's colours or the imprinting of a logo will be of particular interest to OEM customers." "Due to our development following the requirements of different companies and applications, there is definitely a need for wearables beyond the HyWEAR compact. This applies to the design as well as the functional range, which does not necessarily have to be accompanied by identification technology," says Markus Desch, looking ahead. The roadmap therefore already includes the development of further wearable solutions for the next two to three years. In doing so, they remain auxiliary tools and do not follow the idea of displacing a person as a worker from a process. 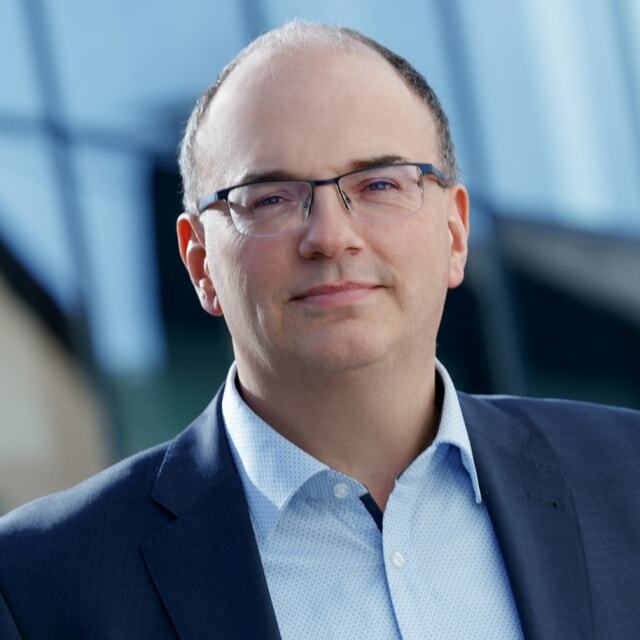 Quite the opposite: "The new freedom in the use of wearables means that the value of human work is once again gaining importance," Markus Desch is certain.